The University of Notre Dame Australia’s Fremantle Campus hosted its annual Awards Ceremony recently, honouring the academic and community-driven achievements of students and staff. More than 220 people filled the University’s Drill Hall on Thursday 21 March for the ceremony, including the Board of Governors, scholarship and award donors, Academics, distinguished alumni and families. A range of scholarships was awarded to commencing students, recognising not only their academic excellence but also their exceptional personal qualities and dedication to their communities. Notre Dame students and graduates across eight of the Schools were then presented with awards highlighting their dedication to their chosen field, volunteer service and commitment to the Catholic goals of the University. 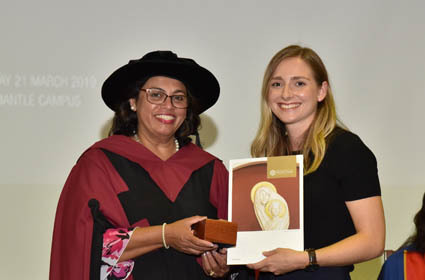 Research Fellow Anna Dwyer and Aboriginal Studies Coordinator Gillian Kennedy became the first academics from Notre Dame’s Nulungu Research Institute to receive The Vice Chancellor’s Award for Initiatives That Enhance Student Learning. The highest academic award, The University Medal, was presented to Nursing student Alexandra Brindley, recognising her as the highest achieving graduate of 2018. In addition to her professionalism and dedication, Alexandra was commended by patients and colleagues for her compassionate and caring manner. During her studies, she was awarded both the Indigenous Health Award and the Dean’s Award for Excellence. The Vice Chancellor’s Award for Teaching (Undergraduate Teaching): Dr Gregory Hine (School of Education, Fremantle). The Vice Chancellor’s Award for Initiatives That Enhance Student Learning (Indigenous Education): Anna Dwyer and Gillian Kennedy (Nulungu Research Institute, Broome). Media Contact - David Charlesworth : +61 8 9433 0569 | 0405 441 093 david.charlesworth@nd.edu.au.